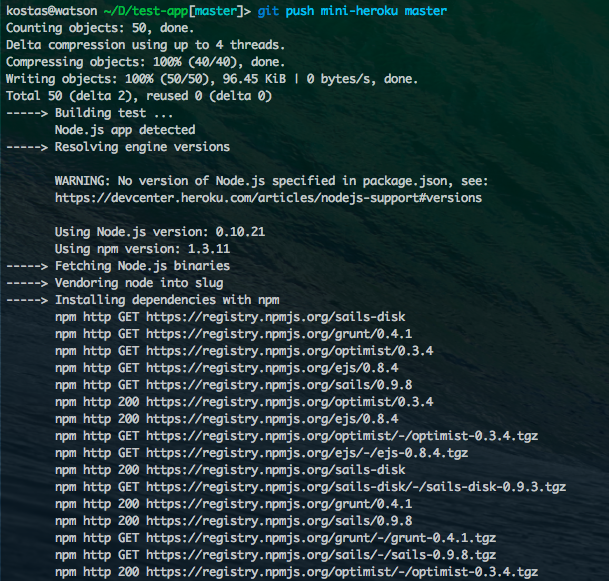 Heroku is one of those really great tools to help you get started fast with hosting. They support a variety of stacks and save you blood, sweat and tears when it comes to deploying an app. But what about those times where you need to mess with filesystems or have custom binaries that you want to run? How about just having more control of your servers? Dokku to the rescue! Dokku is a small (just above 100 lines of code) yet very powerful tool based on Docker. Dokku utilizes Docker and Nginx plus some other candy to significantly simplify the process of deploying. For now I think that Dokku is great for development, maybe as a staging server to be used within a company or for hobbyists. It is super fast to set up and allows you and your co-workers/friends to host apps simply. Dokku also saves you the time for setting up web servers and configurations in the case you just want to host your own apps. Below is a couple of fast steps in order to get started with Dokku on AWS. In this tutorial we will set up a sample Node.js app using Sailsjs. We assume you already have access to AWS. Once the instance is up and running, we need to allow port 80 for our instance. This can be done under “Security Groups” in the AWS console. Now that we have the server up and running go ahead and point any top level domain to this instance. The ip of the instance can be found in the AWS console in the description for your instance (Public IP). We now need to add our public key to be able to push to our Dokku server. Next let’s generate an application and push it to see if it works! git commit -m "Initial commit, cross your fingers that this will work!" That’s it! In 8 simple steps (with hopefully a lot of coffee breaks) you have set up your own mini-Heroku! Hi, its a good explanation and I was successfully able to push my sails app into dokku running on ec2. But I’m not able to access the url provided by dokku for that app. shouldn’t the sails app be running on that url provided by dokku ? or the one configured in vhosts? This is pretty cool, but how does Nginx fit into this? Isn’t Dokku tied to Ubuntu? The Nginx is used a proxy to route basically “route” the apps. Your DNS *.domain.com needs to point to your dokku server. Nginx lies in the front proxying the request to the right application server. Example: User browses to –> app123.domain.com:80 –> Nginx on port 80, realizes it’s a request for app123 –> proxies to localhost:3000 (or whatever port it chose to run this particular app on).